Davis Tool’s engineering team will design and build dies and die inserts for hot and cold chamber aluminum, zinc and magnesium dies. We have a 100% CAD file capability to ensure your dies are designed to your specifications. Our approach includes the use of MAGMA software for flow and thermal simulation. We also deploy FEA software to identify high stress areas. 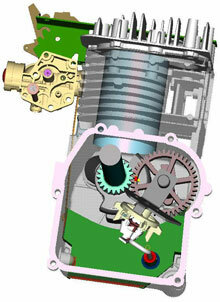 And for repair work, we can generate original CAD files so your repaired die performs as expected in your operation. We engineer dies for high repeatability and to run the first time. Bottom line: Dies produced for you by Davis Tool and Die will exceed your expectations. Our engineers average more than 20 years of experience. 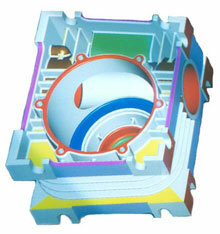 You can count on us to have designed and built dies ranging from simple to extremely complex. We have designed and built dies for 300 to 2,500 ton-locking force. Based on this experience and expertise, you can count on Davis Tool to complete your die cast molds to your precise requirements. New product design: Our engineers can help you go to market faster while reducing the cost, size and weight of your end product. 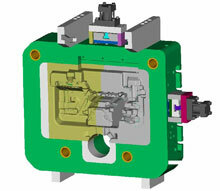 We will work with you to design and build tooling that meets your dimensional tolerances and production requirements. During production, our engineers will make any necessary adjustments to your die to achieve peak performance. Inspection: We review every project to identify and repair defects using the latest inspection equipment and quality tools. Reverse Engineering: We can design and build tooling to replicate existing parts when the original design no longer exists or when changes have occurred. Davis Tool is an ISO 9001:2000 and AS9100 Certified company. Click Here for certificate.